The Master of Development Practice (MDP) at the University of Peradeniya was launched in September 2011 following a two-year curriculum development and approval process which was supported by funding from the MacArthur Foundation and guidance from the Earth Institute, Columbia University. The MDP is a two year graduate-level global multi-disciplinary programme geared toward equipping development professionals with the knowledge, skills and attitudes necessary to address today’s complex development challenges. The Global MDP programme (see www.mdpglobal.org ) which began in 2009 at Columbia University in New York with 23 students now reaches out to over 1500 participants from 25 universities in 20 countries. 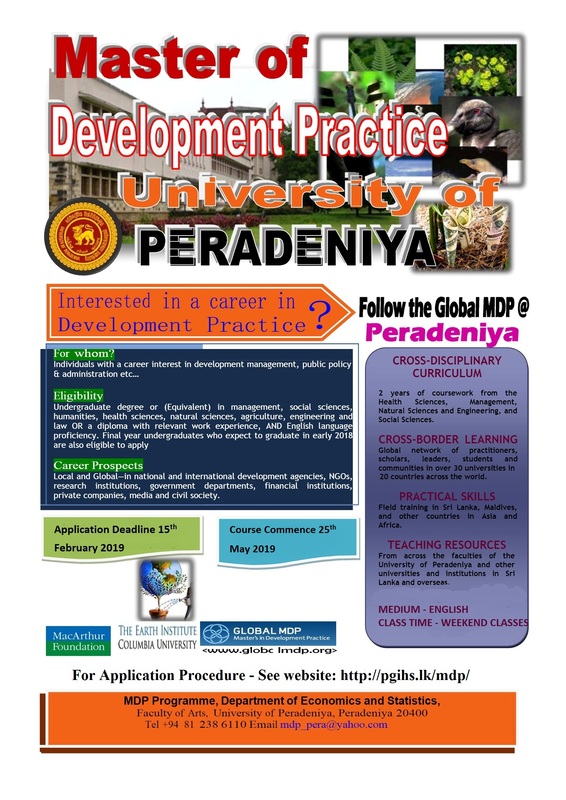 The University of Peradeniya is proud to be the only University in Sri Lanka-and one of only five in Asia-selected to offer the MDP programme. The programme was partially funded by a MacArthur Foundation grant to the University of Peradeniya which was used to enhance the learning environment including new computer and internet facilities for the use of MDP students. In addition, the newly established World Bank sponsored Development Resource Centre which is geared to providing up-to-date development information, data and tools will also be available to MDP students. All MDP students also have access to the Global MDP website which accommodates a growing library of faculty and student resources. The programme prepares students to work across different fields spanning the Social Sciences, Natural Sciences, Health Sciences and Management to design and manage integrated development interventions, design, monitor and evaluate projects, communicate effectively on technical details, and to design appropriate policies to support equitable and sustainable development. Career prospects for graduates of this programme include employment in Development Agencies, Non-Governmental Organizations, Private-Sector Corporations and Government Departments. Every year programme begins in May with a 12-week pre-MDP programme which includes introductory/refresher courses in Writing, Data Collection and Analysis, Leadership, Mathematics, Economics and Natural Sciences as well as second/third-language courses in Sinhala and Tamil. The core programme features a four-semester long cross-disciplinary curriculum designed and taught by Ph.D. qualified lecturers from across the Faculties of Agriculture, Arts, Engineering, Medicine and Science of the University of Peradeniya, as well as by visiting lecturers from the University of Moratuwa, Open University and development professionals. Elective courses (specialisation options) include the sustainable development of tropical coastal areas and small islands, preparing for climate change and disaster risk reduction and management. Course delivery combines student-centred learning with traditional methods, to include lectures, assignments, projects, peer-group interaction, presentations and field visits. In addition to learning from MDP Peradeniya’s academic staff and from each other, students also get the opportunity to participate in a semester-long Global Classroom blended learning course. This has included student participation in a weekly live video conference that is delivered synchronously and “attended” virtually in classrooms spanning more than a dozen time zones around the world with course materials, syllabus, readings and assignments for this course being available on a common course website. After completing a full academic year students follow a three month “field training” internship at a public, private or non-governmental organization to gain hands-on real-world experience in development practice. For students already employed, this may be fulfilled at their own place of employment provided it fits the requirements of a development practice related institution or project. During the field training, students are expected to gain hands-on experience in a development practice context; apply the knowledge gained in the classroom in a real-world setting; be able to integrate/apply knowledge from different sectors; develop technical skills relating to development activities and make a useful contribution to the community/internship organization. Students are encouraged to gain competencies in at least three of the five, and be exposed to all five areas identified by the Global Network: Technical Skills, Integrative skills or cross-sectoral understanding, Communication Skills, Project Management and Social Cultural Skills. Internship activities will vary widely across placements. However, all internships are expected to provide students with opportunities to engage in experiential learning and professional skill-building, in line with the aforesaid objectives and intended learning outcomes. By acquiring interdisciplinary knowledge and practical skills, students will prepare to work across different fields to design and manage integrated development interventions and to design appropriate policies to support sustainable development. The MDP at Peradeniya has been able to attract and enroll seven cohorts of highly motivated and engaged students by 2017, the majority of whom have field experience in Development Practice. The location of the University of Peradeniya in the centre of the country makes it an attractive and convenient choice for students who travel to Peradeniya from many parts of the island for lectures on weekends. The medium of instruction is English. The total fee payable is Rs. 228,000 for the entire two-year programme, payable in installments. First year first semester examination for the 06th and 07th MDP batch will be held on 20th and 21st of January 2018. Time table will be posted later. MDP students had planned to visit to Vilpattu- Musali area on 01st and 02nd of December 2017 for a Field Study tour related to the course of Human Impact on Natural Environment. MDP students presented their research at the 5th PERADENIYA INTERNATIONAL ECONOMICS RESEARCH SYMPOSIUM (PIERS) on 12th October 2017 at the University of Peradeniya. ARE YOU PASSIONATE ABOUT DEVELOPMENT? The speakers are Dr. Elizabeth King, Senior Non-resident Fellow, Brookings Institution, and former Director of Education, World Bank, Washington, D.C. and Dr. Mead Over, Senior Fellow, Center for Global Development, Washington, D.C. Dr. King will speak on _Lessons learnt from designing, understanding and implementing education policy_ and Dr. Over will speak on _Evaluating public (health) programmes_. This year MDP night will be held on 8th of April at Royal Garden Mall in Kandy. Fifth batch of MDP is organising this year MDP night and all lectures, past students and the current students are welcome for the event. The general convocation of the University of Peradeniya will be held on 16th of May 2017 at the Bandaranaike Memorial International Conference Hall (BMICH) for the conferment of undergraduate and postgraduate Degrees. Twelve MDP degree holders will be conferred the Master of Development Practice Degrees at this Convocation.